Japanese Episode DP 006: "The Lost Forest! Shinji Again!!" American Episode 470: "Different Strokes For Different Blokes!" Our heroes are eating lunch one day when Shinji, the trainer Satoshi had battled outside Nanakamado-Hakase's lab, appears and challenges Satoshi to a revenge battle! Satoshi accepts, so a match between Satoshi's Naetle and Shinji's Hikozaru begins. As the fire monkey launches attack after attack, Satoshi's pokemon doesn't make a move to dodge! As Satoshi tries to figure out what his pokemon's problem is, the Rocket-Dan appear and snag Naetle! Annoyed that his battle is interrupted, Shinji orders his Hikozaru to attack the trio and sends them blasting off again. However, the shockwave of the explosion sends Satoshi and Shinji over a nearby waterfall! Once they see that the two trainers are OK, Takeshi and Hikari tell Satoshi that they'll meet him on the other side of the forest. 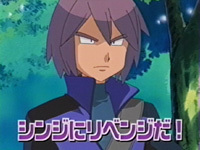 Shinji tells Satoshi that the forest is known as the Lost Forest (迷いの森), but when the young trainer reveals that he's never heard of it, Shinji becomes annoyed and walks off. As Satoshi and Naetle make their way through the forest, the young trainer learns that the reason Naetle wouldn't dodge before was because it was too stubborn. Satoshi tells his pokemon that it needs to learn to believe in him and trust his decisions. Suddenly, a horde of Spear appears, so Satoshi and Naetle start to run for their lives! He runs into Takeshi and Hikari along the way and eventually stop when they find themselves face-to-face with a Ringuma! Shinji appears and captures the bear pokemon, enabling everyone to leave the forest. Satoshi challenges Shinji to a rematch, so the two rivals battle once again. This time, Naetle actually dodges Hikozaru's attacks, but it's not enough to earn it a victory. Shinji's Hikozaru wins, so the young trainer walks off as Satoshi vows not to ever lose to Shinji ever again. I like this episode quite a bit. We get to see Shinji again, we're treated to some good Satoshi and Naetle scenes, we get some crazy illusions brought about by the Odoshishi, and we get a good battle at the end. I also like how Satoshi keeps trying to befriend Shinji throughout the episode and how, at the end of it all, he realizes that it's really no use. The rivalry has officially begun, and I can't wait to see where it goes. And who can't love watching the Rocket-Dan's motto interrupted by an Ember attack? It's moments like those that make Shinji such a badass. The dubbed version changes Shinji's little catch phrase whenever he throws an empty Monster Ball. In the dub, he says "Pokéball, get it!" but in the Japanese version, he says (in English) "Monster Ball, attack!" Which do you like better? Odoshishi and Spear keep their Japanese voices. James: "The next thing you know, they'll think we've been replaced by Butch and Cassidy!" Kojirou doesn't mention Yamato and Kosaburou in the original...he just yells at Shinji for attacking them in the middle of their motto. It's a throwaway line in the original and I can see that PUSA is trying to give the show more of a sense of continuity than 4Kids ever did, so I guess I don't mind. Just like they did in the last episode, PUSA takes a comedic scene that had really goofy music in the Japanese version and plays this ridiculously serious music in its place. This time, it's the scene where Satoshi's running away from the Spear. It has this great piece of music playing in the Japanese version that lets us know that it's a scene being played for laughs, but the dubbed version makes it look like it's this terrible life or death struggle. It's episodes like this one that make me wonder if the music editors even listen to the music in the original version before throwing it all away for their A.D.D.-friendly compositions. TO BE CONTINUED is three seconds longer in the dub.